Do you remember that time when you wanted to grow a beautiful plant in your home, but it just didn’t work? The possible reason for this is a bad potting soil, which causes the plant to grow an unhealthy rooting system. Potting soil is also known as potting compost or potting mix. It’s a medium in which you can grow vegetables, plants, and herbs in a pot or a container. The demand for potting soil is high during the whole year as people can and want to grow their herbs indoors constantly. This article will show you what the best potting soils are available in the market today. Professionally made Myco-Tone formula utilizes 11 strains that will make your plants grow faster without any stress. The potting soil is a blend of fertilizers, peat moss, and perlite. It provides your plants with 16% potash, 21% nitrogen, and 11% phosphate. It’s important to mention that potting soil options are almost countless. However, you have to keep in mind that not all options will provide your plants with the base they require. You need to know the differences and features between the two main categories of potting soils: organic and non-organic. Most people usually prefer using organic soil for their plants. In most cases, this is because organic soil doesn’t contain genetically engineered pesticides and chemicals. As the name suggests, organic material is more beneficial than regular soil. In this soil mix, natural materials ensure that your plants will be provided with the nutrients they need to flourish. Different organic soil mixes will have different ingredients, however. Some of the most common ingredients are compost, seaweed, soybean meal, humus, mushroom compost, fish meal, bat guano, and bone meal. Depending on the plant you want to grow, the exact potting mix you should use will vary. For example, planting succulents and cacti will require different potting soil mixes than planting orchids as they will require different nutrients for growth. 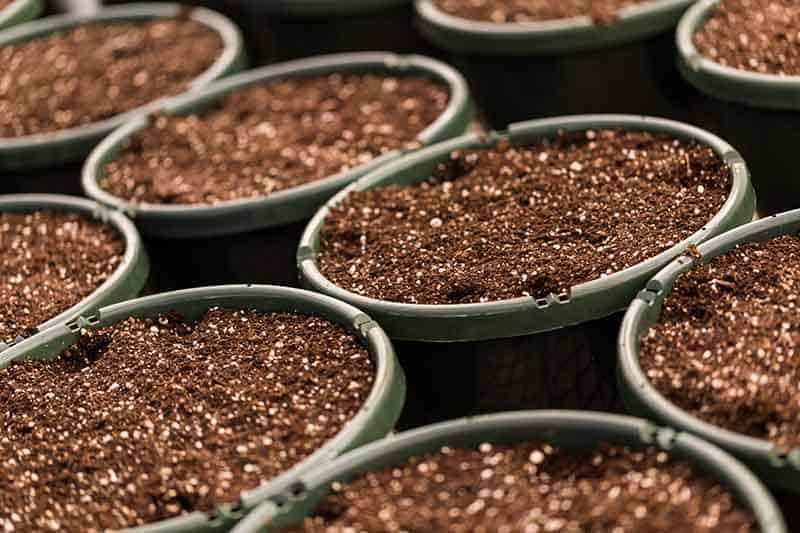 Therefore, using the proper organic potting soil will ensure that your plants will grow naturally and that their rooting systems will be healthy. On the other hand, non-organic soil doesn’t contain any organic matter. Also, you won’t find any common ingredients that are used in natural soil mixes. This soil is something that people like to call “regular potting mix,” and it’s a combination of bark, peat moss, and perlite/vermiculite. You will find these ingredients in most of the non-organic potting mixes, but different products will have different combinations, and some will even have extra nutrients and minerals. 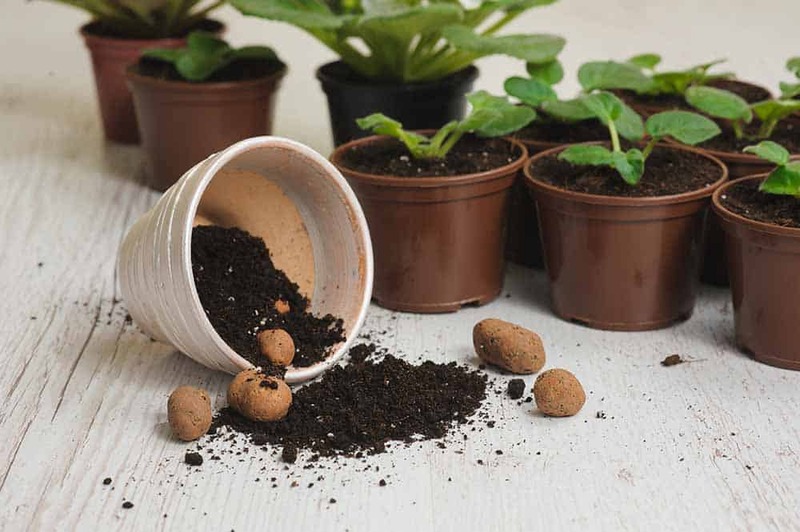 From time to time, you will find a non-organic potting soil that includes Styrofoam in the mix to hold more water and to create more space for air. However, these mixes are very cheap and not as good for your plants as Styrofoam will come to the surface, and the wind will blow it away, giving the pot or container an unappealing look. All potting soils serve basically the same purpose, which is feeding the plant with water and nutrients. Therefore, they all have similarities. The differences are in the ingredients and the plant type that you should use them for. Fox Farm Ocean Forest soil mix is great for container plantings. It is very well aerated and has a light texture with ingredients that contain bat guano, micronutrients, and earthworm castings. Espoma AP2 is a 100% organic potting mix that you can use for both indoor and outdoor container planting. It features the Myco-Tone formula that’s known for saving water. Hoffman 10404 is an organic soil mix uniquely made for growing cacti and succulents. It’s formulated for use with both desert and jungle cacti and will provide your cacti with the drainage that it needs to flourish. Black Gold is a potting soil plus fertilizer product meant for all types of pot-grown vegetables, herbs, and flowers. It’s also the only item on our list that’s OMRI rated. Miracle-Gro potting soil is able to feed your plants for up to 6 months. It’s also meant to be used only for containers and pots, but it doesn’t matter if you use it outside or indoors. This 11.2-pound Fox Farm Ocean Forest Potting Soil is usually listed as one of the better potting soils on the market. Many professional gardeners recommend using this product, and those statements are maybe enough for you to choose it as a great potting mix. You will be able to use it as soon as you open the packaging as you don’t need to add any other substances into the potting mix. It’s a great soil for container plantings, and you can be sure that it will provide you with productive and healthy plants. It contains sandy loam, forest humus, peat moss, and other natural fertilizers, including bat guano, crab meal, ocean fish, and worm castings. The soil pH value is between 6.3 and 6.8, which will allow fertilizers to do their job very well. The fertilizer’s formulation will last for more than 30 days in this mix, meaning that you won’t be required to add additives once the soil starts breaking down. It’s a good choice for beginner gardeners or for those who don’t have a lot of time to dedicate to gardening. Most users report that even though it’s a little pricey, this is the best product for them. There are only a few customers who reported that this potting mix didn’t hold water very well. This 40-pound Espoma AP2 Organic Potting Mix is ideal for use in both outdoor and indoor pots. This well-received potting mix is full of nutrients that guarantee your plants will grow very well and give you a bumper harvest or some beautiful flowers. Epsoma is a well-known brand, and the company enhanced this potting soil with a professionally made Myco-Tone formula. This formula will help you to determine how much water you need to use when watering the plants – not too much, not too little. The potting mix will retain a huge amount of water, meaning that your plants will always be provided with enough water for them to flourish. The Myco-Tone formula also utilizes 11 strains that will make your plants grow faster without any stress. This is also very useful if you want to take your indoor plants outdoors or move them to another container. The description on the potting soil shows that everything inside is organic and it guarantees that your plants are going to get at least 2% potash, 7% nitrogen, and 2% phosphate. Some users report that this potting mix is the best commercial soil for growing plants indoors. Also, they state that new gardeners should definitely use this as it has a beautiful earthy smell, a lot of perlites, and maybe the most important, for some users, no bugs. Hoffman 10404 Organic Cactus and Succulent Soil Mix is, as the name suggests, a potting soil specifically made for succulents and cacti plants. The company states that the formula inside the soil is perfect for both jungle and desert varieties of cacti and succulents. With overwhelmingly positive user feedback and these statements, you can be sure that your cactuses will grow fast and healthy no matter their type. The balanced pH value of the potting mix is ideal for both succulents and cactuses, and you can use the soil immediately after opening the bag. The company guarantees that the formula can provide enough drainage that succulents and cactuses need to grow properly. The company uses peat moss, limestone, sand, and sedge peat to create this formula, which guarantees the nutrients needed for proper growth. If you don’t have experience growing succulents or cacti, the company provides very useful directions on the package that you can use to understand the process better. Overall, the majority of customers are very happy and satisfied with this potting soil. They report that the package is a lot bigger than they would expect for this price range and that their Jade plants and cacti both grow and do very well in it. There are a few users who reported that this potting soil is hydrophobic, meaning that it will repel water if it’s dry. This 16-pound bag of Black Gold 1302040 potting soil is great for growing your potted vegetables, herbs, and flowers outdoors and indoors. The potting mix is very affordable, but it still delivers the nutrients that are necessary for plants to grow healthy. The soil mix is rich with organic fertilizer, earthworm castings, pumice, and perlite. All of these ingredients ensure that your plants aren’t going to lack any nutrition value. Depending on where you live, the size of the packaging is going to vary. However, it will usually be enough for planting a lot of small pots. A great plus for this company is that the formula of the soil is also going to vary depending on the regions due to the differences in soil composition and climate. The potting soil is a loamy and rich mix that you can use for different kinds of gardening applications, and because it has perlite in it, your plants will have the right amount of air circulation for their growth. As this potting soil is quite affordable, some users were skeptical and didn’t know what to expect. According to their reports, they were surprised when the plants started to grow very fast and that the blooming period came as quickly as possible. Some users, however, reported that they had problems with gnats and that the soil can grow mold when it gets too wet. This 2-cubic-feet Miracle-Gro Potting Mix will ensure you that your plants get all the moisture, air, and nutrients they need to be beautiful and grow as large as possible. The potting mix has a very unique formula and pH values that are perfect for any plant type. The potting soil is a blend of fertilizers, peat moss, and perlite, meaning that it provides everything that a plant needs. A difference between this and the other options on our list is that this one is able to improve the quality of other soils, leading to healthy root systems. Another great feature of this product is that it can feed your plants for 6 months, which is enough for a great number of vegetables to reach their maturity. As already mentioned, this potting soil has multiple purposes. However, Miracle-Gro has other mixes for shrubs and trees, flowers, roses, and a specifically designed mix for herbs and vegetables. The important thing to mention here is that this potting soil will provide your plants with 16% potash, 21% nitrogen, and 11% phosphate. Users report that they are very happy with the amount of soil they get from the package and that it works very well with other soils too. One user reported that their plant grew three times in size once they added this mix to their existing potting soil. There are also reports from users saying that they sometimes find wood chips in the soil and that this soil caused them problems with gnats. Overall, potting soil has almost the same purpose as any soil in the ground; it supports the plant and delivers water and nutrients. Good potting soil will have a resemblance to the native soil of the plant. Also, it has to overcome the organisms it lacks, which would normally be transforming the soil in the ground, and it has to be light enough to resist compacting and to be easy to transport. Some commercial brands of potting soil include a fertilizer into their soil. This is a benefit as fertilizers help the plants to grow; however, it’s very difficult to distinguish how much fertilizer you are going to give to a plant at a time. 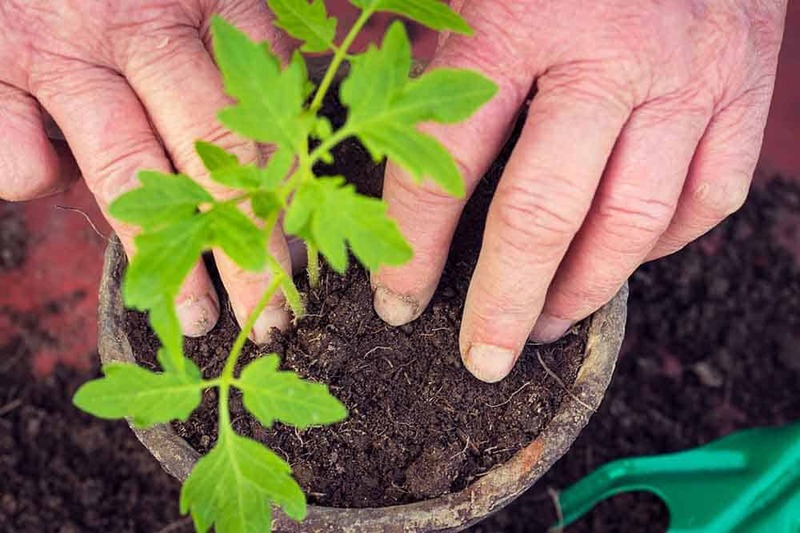 If you are a type of person who would like to keep track of the type and the amount of fertilizer you use on your plants, you will benefit more from using your own soil and using fertilizer separately, so that you can be sure you’re using only as much as you’d like. In case you don’t want to use a chemical fertilizer, you can always make a compost tea and water the plants with it to maintain the plant and add necessary nutrients. The potting soil’s efficiency for your plants is completely reliant on you. You have to water it frequently. If you are living in an area where it’s not raining much, plants are going to extend their rooting systems outward and downward in search of water. A lot of high-quality potting mixes include an element that controls the moisture. For example, horticultural vermiculite will hold the water and will make it available for the plant. As mentioned above, there are two main differences between potting soils. The organic potting mixes will usually be heavier and more expensive than the non-organic ones. Also, organic soil is made from organic matter, unlike the other option which is made from industrially-made ingredients. Last, but not the least, the non-organic mixes are known for losing their nutritional value over time, unlike the organic soils which you will be able to reuse in most cases. It’s important to understand the difference between these two potting soil options. However, it’s only the first step of many because you still need to know which of them is the best option for your plants. 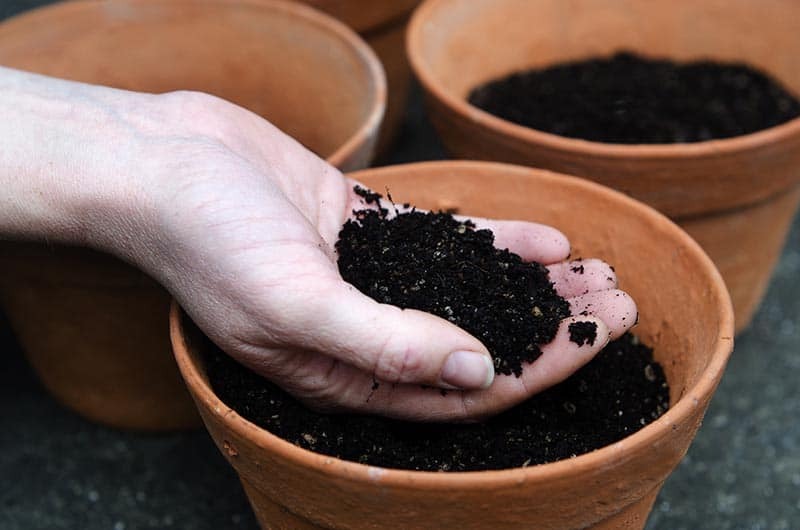 To further help you with that, here are a few important things you have to consider before you buy a certain type of potting soil. The potting soil of your choice should be able to retain moisture and essential nutrients because plants need those in order to grow. Before you buy anything, either organic or non-organic soil, be sure to check if the soil has this ability. You can find this out if you check the description of the product and read the list of ingredients in the mix. For example, in non-organic soil, peat moss will help to retain nutrients and moisture, meaning that the more peat moss, the better the moisture and nutrient retention will be. Apart from the moisture and nutrients, your plants are also going to need good air circulation. Your potential potting soil should definitely guarantee this. Fluffy and light mixes are very good for this as they will provide maximum airflow. The soil mix you get also shouldn’t get too dense when it’s wet as this will prevent developing mold and smothering the plant. The soil density is very important, and you should be sure that it will be good for your plants before you buy the soil mix. You can simply test this by poking it with your fingers, and if it has some flexibility, it’s okay. Also, your potting soil isn’t supposed to become hard when you add water to it because this will cause the plants to grow their roots very hard through the soil. One more way to test the soil density is to just lift the bag before you open it. If the bag is very heavy, the potting soil is probably full of fillers, such as sand or mulch, and most plants will find this kind of soil unsuitable for the best growth. Never buy a potting soil before you take a look at the list of ingredients to find out what’s inside the bag. Good potting soil shouldn’t contain only one nutrient because your plants won’t benefit as much from it. The more nutrients a potting soil contains, the better your plants will use it and will grow healthier. Before everything, we recommend not using the soil from your garden or your yard, as it can contain fungal diseases, weed seeds, and insects. Simply buy a potting mixture, and you’ll be much better off. When it comes to watering the soil, you can probably water it once a week if the weather is mild in the spring. However, plants are going to need more water as the summer continues. The warm weather will evaporate the moisture before the plant can even use it, and your plants will require more water over time because they’ll get larger. Always water the soil, not the flowers and leaves. If you wet the foliage, you are creating the possibility for your plant to get a fungal disease or scorched leaf spots. Plants that grow in the ground need much less fertilizing than those growing in containers. The more you water the soil, the faster you are going to flush the nutrients out of it. If you would like to have the happiest and healthiest plants possible, you should feed them with a soluble fertilizer every few weeks, according to the directions on the package. If you are new to gardening, there are a few things you should know before you put your plants into containers. If you plan to use a very large container for your plant, place it somewhere where the plant is going to live. If you don’t do this, you will be forced to move that container to another place, and that’s not going to be a great day for your back. It can be overwhelmingly heavy and might even require a team of people to move the container. Always try to use containers that have drainage holes, and the more holes, the better the outcome. If you don’t have such containers, you can always drill some holes in your containers to achieve the effect. This way, you will avoid overwatering your plants. Keep in mind that you have to check the moisture requirements for your plants. You can simply check if you need to water the soil by putting your finger into it up to your second knuckle. Water your plant if the soil feels dry at your fingertip. Overwatering the plant might cause its leaves to fall off or turn them yellow. If the soil is very wet, consider moving your container to a breezy, dry spot until it becomes less saturated. Under-watering the plants causes similar problems to overwatering. You will have to water the plants at least once a day in the summer. If you are using small containers, you should consider watering the soil even more times a day as it holds less soil. Make sure that you soak the soil in the water when you are watering. If you just give the soil a couple of drops, the water will penetrate only the top layers of soil. Based on the product descriptions above, we can determine that the clear winner here is the Fox Farm Ocean Forest Potting Soil. This is the best option for people who aren’t professional gardeners as it provides a very good and quality base for almost all plants and is very easy to use. On top of this, it has great water retention, quality nutrients, organic materials, and good user reports. All of these reasons, along with a reasonable price, make this our number choice.